In the pro sound world there are also many exponents of the same bass 'heft' idea, and so old style heavy iron core transformerred power amps are considered best for bass and sub cab reproduction. The modern powered lightweight cabs mean you can have more power for your money, but 'heft' is still 'heft'. Of course big artists specify the latest high tech rider friendly line array, but many providers would rather have the bottom end the old fashioned way. After a year or so in semi retirement I dragged my old plexi amp out to a gig on Friday. Bear in mind that in the meantime I've been using a well regarded valve combo. For the time I was on stage I was grinning like a Cheshire cat, that sound was just gorgeous. Someone videod the gig and I'm actually dancing! Those that know me can attest that fat 60 year old arthritic guitarists just don't do that. Even the drummers wife said i looked like I was really enjoying myself. The cab might have to go, two x 12" JBLs in the JBL cab is harder to lift than I remember. For a couple of weeks I'd been toying with the idea of a line 6 pedalboard or maybe even the whole digital setup. Not now, now I remember what a GOOD valve amp is there is no way I'm taking that step anytime soon. If you haven't played through a good valve amp do yourself a favour. I think something like the Suhr PT15 is the way forwards, or indeed the Reactive Load IR/Ox Box/Waza Expander to "digitally model the back end" as they say. I love my valve amp and real pedals, but want digital flexibility and most importantly the ability to run it silently/through headphones. I keep thinking about getting a Helix but it just seems like such a boring safe option. Running a real amp into a load and IR appeals much more to me for some reason, but it could just be the whole "t00bz is better" myth - I change my mind about it daily. We probably just cling onto valves as it's what we've always known but it's probably time to join digital like literally every other industry and product we own! Then again I've also never had a modeller sound or feel as good as a valve amp. OK - largely, it's the other conveniences. However, if I were a rock star recording an album at the studio, I'd probably get my reference tone with a Helix and get the engineer to re-amp through his choice of amps to try to better it. Why? Because I can get the tone I'm after much more quickly with the Helix, and that would give the engineer a good starting point without me farting around wasting time and money. If I was touring...there's no way in hell I'd be shipping massive, unreliable, heavy amps all over the place. I'd just have a Helix (and possibly a spare) with all my presets on, a couple of my current squeeze of power amp and have a known-quantity cab on the rider. Why waste all that money when nobody in the audience will a) tell the difference, or b) care? You're confused because you seem to be trying to make it "this thing" or "that thing". Digital modelling can be used in any number of ways. I, for example, use the Helix live without any cab modelling, into a power amp, into a real cab. I've never met anyone who could definitively tell me whether it was a modeller or a valve amp at gig volume. However, when I'm recording, I use it with my favourite cab impulses, and after a bit of massaging from a class engineer, I'd be stunned if anyone could tell the difference. On top of all that, I can make signal paths that would be all-but-impossible on anything but an insane budget with my Helix. Modellers can do waaaaaay more than traditional pedalboard-and-amp rigs can reach in their wildest dreams. When you get as far as the AxeFX II or Helix, the limits are more likely to be your imagination than the unit itself. The fact is that while folk try to put all modellers into a single basket with a single "purpose", they actually have many different use cases....whereas valve amps have only one (or maybe two at a push if you run them into a reactive load). Ultimately, they're just a hell of a lot more useful to me than any amp (or collection of amps) has ever been. Odd - I may not be much of a sample size, but my experience with Class D has always been positive. I started with a Markbass Little Mark II into various cabs, continued with a Markbass 3x10 combo that I gigged in a 10pc band and was magnificent and finished with a TC Electronic BG250 which was fine for what I was using it for and never felt like it was lacking anything. I played through a Marshall VBA400 a couple of times when I had the Markbass combo and it didn't make me think "I must have one of these". For live use I found this to be the worst of all worlds. Get an amp and stick a mic on it or get a modeller and stick it into the pa or a cab. Amps into loads with impulses and other bits is too complicated, requires too many boxes, too much time to set up and just ends up wasting your time debugging problems. Generally it doesn't sound better either, or at least didn't in my case. It's so much easier to do things like switch your amp on unloaded and blow it up as well. Another massive problem is the guitarists' obsession with making their gig-volume live solution be the same thing they use at home. Even with a modeller, that ain't gonna happen - at least, it's not going to sound remotely the same. So why even bother trying? Yeah, I'm thinking more for home use. At a gig I'd just use the amp as normal. An all in one digital solution is obviously the easier solution for at home, I'm just thinking about what would be the most enjoyable solution for me. You're confused because you seem to be trying to make it "this thing" or "that thing". Digital modelling can be used in any number of ways. Yeah, that is true. And my needs are very simple and I don't like too many options so I don't feel the benefit of the flexibility of most modellers. 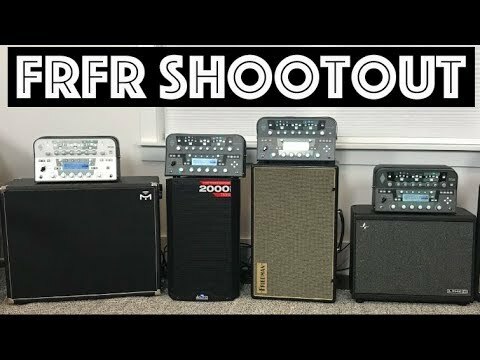 I posted the below video on another thread here but it highlights the point...for me, the best sounding ones are the ones that sound most like a guitar cab. Are the other ones trying to sound more like a guitar cab too? Coz they really don't. I mean, presumably when sound engineers are micing up your cab and mixing the FoH sound they are trying to deliver the sound of your guitar cab to the audience. So, in the same way, should we not be expecting the sounds out of these FRFR solutions to be 'as good as' your backline? I suppose once we do get that, everyone will switch to modelling/FRFR. Do you know how many albums have original pods on them? I think we’re a bit spoilt in the UK for high end guitar and amp gear. Some of the stuff we have just lying around the house, people in other countries can only dream of, even professional bands may not be able to afford them. There are loads, especially once the second iteration of the Pod was released. And through the 90’s truckloads of albums were done with the Line 6 Amp Farm ProTools plug-in. I think you are right in one way stop modelling Fender marshall boogie etc. But then you have one big problem Guitarists. in a world of Strats Les Paul and Tele derivatives being probably 80% of the market who will want to play something original. Unless you spend a fortune trying to get a group of players to endorse it. Have a successful album or a tone that ignites a whole style of music. I think a number of software plugin companies have tried to model a few of there own things suited to a style of music but not slavishly one thing. Studio Devil back in the early days when I used it was really just some sort of good sounding hot Rod marshall without slavishly trying to model one thing. Same with toneforge menace as an extreme metal amp but most have expanded out these days to become more of what people know and expect Fender Boogie Marshall etc. So it’s not can it be done but do people actually want or use it. Genuine question - can anyone point towards a truly stunning guitar tone that was done with a modeller, recorded or live. All the talk is of convenience and “no one can tell the difference” but wondered if anyone was pushing the boundaries with them to create great sounds in their own right. Through my own musical taste I can only think of what Adrian Belew was doing with Roland rack gear direct to PA in the early 90’s - love the tone below, so juicy and absolutely not trying to be an AC30 or a Dual Rec. I've always used my gig-volume valve amps at home... I just turn them down, or in some cases use an attenuator. They sound the same - or at least close enough that it doesn't take a lot of adjustment to get there. I certainly wouldn't have any problem using the same modelling amp for both, since they're even less volume-dependent. Listen to any Garbage recording, studio or live - they don't use amps at all, just Pod Pros straight into the desk. You won't hear any "classic valve amp tones", but that's the whole point. It's really about understanding which bits are volume-dependent and which bits aren't. You obviously do, but an awful lot of people don't seem to get that the "boom" you get when you've got pretty much any well-set-up amp at gig volume simply isn't going to happen at home volumes, no matter what you use. I believe Evanescence's Fallen album was done with Pod Farm.
. I mean, presumably when sound engineers are micing up your cab and mixing the FoH sound they are trying to deliver the sound of your guitar cab to the audience. Depends on the venue, and time constraints. For a decent venue, when you get a sound check, then yeah chances are the FOH will move the mic placement a bit, but that tends to be to suit the sound of the room. majority of smaller venues or the dog&duck, when FOH have got 30 minutes to check 4 bands before doors open... they just need some sort of signal coming through their mics to put through PA. I think the issue with modelling is that traditional guitar amps are in a way 'broken'. You are basically getting a signal and putting it through a series of tubes, sometimes at a high enough level to run them out of spec, and then it goes to a rubbish speaker with limited range. Tubes are funny as well, as they are completely analog and rely on physical processes, their operation can depend entirely on atmospheric noise and this is almost impossible to model. It's also difficult to model the interaction between speaker and amp without developing some sort of smart speaker that could programmatically adjust the way it operates and in this way through communication between the speaker and amp, we could get a more realistic output. None of them sound like a guitar cab, apart from the Line 6 Powercab - when it's being used properly. Why? Because microphones aren't ideal sound detection devices with entirely flat responses. They affect the tone as much as the choice of speaker does. I mean, presumably when sound engineers are micing up your cab and mixing the FoH sound they are trying to deliver the sound of your guitar cab to the audience. No. they're trying to get a sound into the desk that's ideal for the way they want to work with it which results in the best overall sound getting into the audience's ears. Generally speaking, that's not particularly related to the sound that the guitarist wants to get from their amp/cab. That's very true. You might actually be able to get it closer with modelling and headphones, simply because you can get the apparent volume up to the same levels. Personally I hate playing through headphones... but modelling may have an advantage exactly because there is always a small amount of latency, which mirrors what you get when you're standing a little further from a real amp - there's a delay of about 1mS per foot purely due to the speed of sound. You can get closer to the apparent volume, but then you lose the environmental reflections - which are also massively important, IMO. Your brain expects them to be there, so when they're not...uncanny valley.